Horror visual-novel game, Okuriinu, is heading for the Japanese Nintendo Switch eShop next Thursday on 12 July 2018. 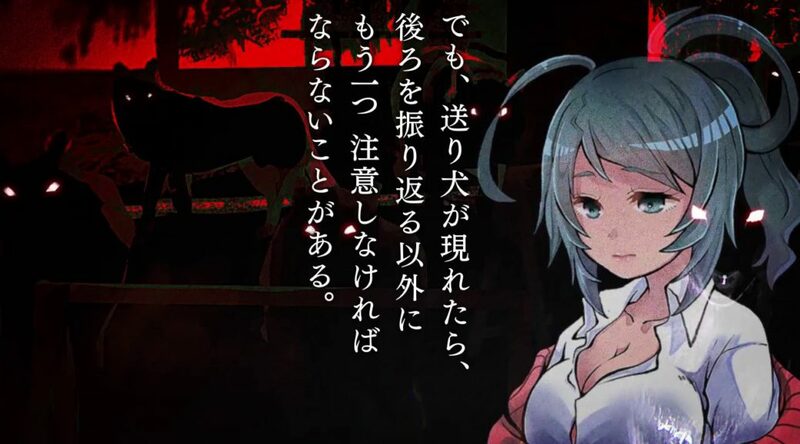 The game will cost ¥990 and will come with 2 additional chapters compared to its mobile release. I loved the strange stories that grandma would often tell me as a kid. As I grew older, I remembered less and less of those stories, but I somehow remembered the story of a yokai called Okuri Inu. Okuri Inu is a yokai that lives in the Yatsugatake Mountains, who was said to be something like a mountain god. In the past, there were said to be many mountain hounds, and it was not rare for travelers who let their guard down to become one’s prey. When walking the Yatsugadake Mountains at night, you can hear footsteps lightly following behind you. Do not look behind you. If you turn around, you will be eaten. If Okuri Inu appears, it will protect you from the mountain hounds and monsters living on the mountain until you make it back home. If you make it back home safely, give Okuri Inu salted onigiri or a sandal and it will gladly return to the mountain. It is a bodyguard that you can depend on. However, there is one more thing to be mindful of other than not turning around if Okuri Inu appears. That is, do not fall over. If you fall over, Okuri Inu will attack you, and surely it will eat you. If you fall over, that is what is said will happen.